No. 1 is a good website: Good design, Clear ‘call to action’ so clients can find what they want straight away, Content & Google wants to see you updating regularly, Navigation (across the top is best) focus on getting people to the right part of your website, Credibility (get your accreditations up there), Mobile Friendly & your social media buttons clear. For SEO compile a list of all the key words for your product or service – an Excel doc will do – show this to everyone who does anything online for the business – don’t assume you know what people will Google. These key words should appear in URL title and meta descriptions, headings, images and Alt descriptions, but not so over the top that clients switch off (it’s only for Google). Some great content Lynsey. Whatever you do in Marketing – Measure it, Test it – don’t just put a system in place and hope marketing works. On Adwords – providing you’re generating business, they make good sense. In his delivery he did some live tests for the audience to participate in choosing which bar or button they would have clicked, and showing what actual digital tests had proved, e.g. 3 Google adverts with slightly different wording and which had infact generated the highest response. Thanks Tom, enjoyed you’re tests & the audience interaction was great. In Jan 2016 there is 7.395 billion people alive, 3.419 billion Internet users, 2.307 billion active social media users, 3.790 billion unique mobile users (this is 51% of the total population!) and 1.968 active mobile social users. Social Media use across the world is 31% but in North America it is 59% of the population; South America 50%; West Europe 48%; East Asia 48%; Ocenia including Australisia 45%; East Europe 45% and Central America 40%. After that there is Southeast Asia at 37%, Middle East 26%, South Asia 11%, Africa 11% and Central Asia 6%. Reddit is popular, given that the website looks a shade 80-ish… definitely worth looking at it if your product is technologically niche, scientific, innovative. Facebook is everything, talk to your clients when they are in their lest defensive mode. Social media is about brand-awareness, not about your products & services, it’s about your great relationships. ROI on Direct Mail/marketing sent out by post is now up to 10% – this is largely thought to be due to the lack of post we receive that more envelopes get opened. If your website is not getting a 10% return (100 visits, 10 actions) then social media is not worth starting… Food for thought that, Mili. Another bacon roll please. Hobart is part of ITW a global diversified manufacturer of specialised industrial equipment. For Hobart this means industrial dishwashers, a unique range of warewashing equipment that delivers the best in innovation. Advanced solutions built for the customer, from Glasswashers for sparkling clean glasses, to Utensil washers for top-hygiene performance. 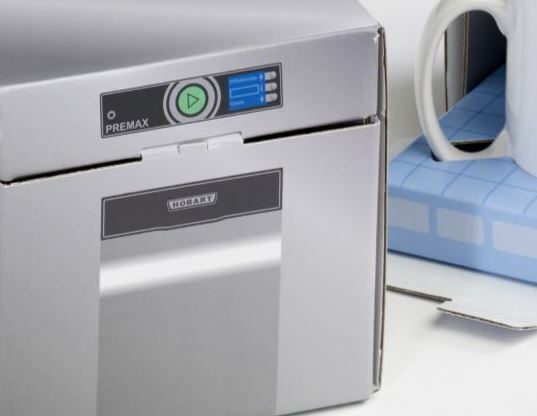 Pass-through Dishwashers and Rack Conveyors for high-use industrial users, fast Undercounter Dishwashers, Flight Type Dishwashers and 3 guesses who for… You’ve got it, rest assured they have thought of every type of user. The campaign to send a mug out to 300 prospectives was a targeted “new enquiries generator” directed by Jellybean Creative working on behalf of Hobart. From the brief specification: Can the box look like a dishwasher? the pack was designed spot-on without hesitation from the BoxcoUK Studio. The mug was held securely in the plinth with a snug fit for extra protection. “Enjoyed creating this simple but effective piece. 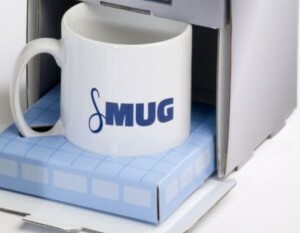 We had the suggestion that they send the mug out upside down – as if it was being loaded into the dishwasher – with “Smug” printed correct way round (and therefore upside down when correctly placed)! Want a new innovation in your marketing?